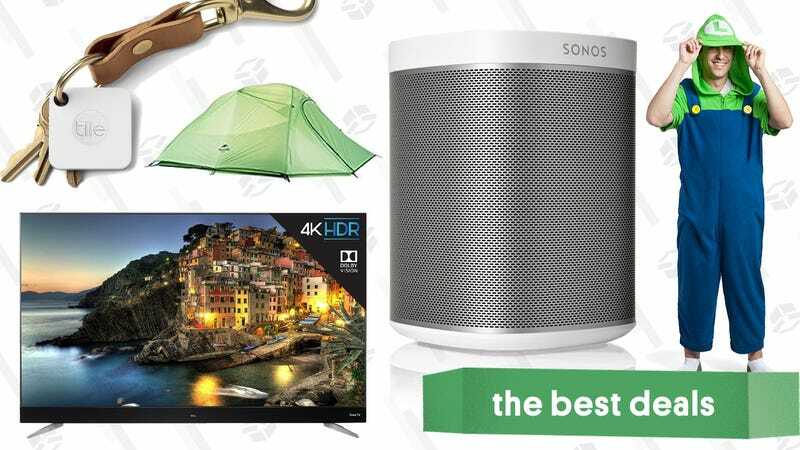 One of last year’s best TVs, discounted Halloween costumes, and the best deal we’ve ever seen on Tile device trackers lead off Friday’s best deals. Whether you’re buying them all for yourself, or sharing them with particularly forgetful family members, we’ve never seen a better deal on the Tile Mate than this $44 8-pack. The Mate’s most obvious home is on your keychain, but it’d also work great on a gym bag, in your luggage, or even attached to a TV remote. This 8-pack has been selling for over $90 lately, and today’s price is easily an all-time low. I wouldn’t be surprised if it was a price mistake. Update: Back in stock, in white only. This won’t last long! While it doesn’t support Alexa or AirPlay 2 like the newer Sonos One, the original Sonos Play:1 is still a terrific sounding speaker that can sync up with other Sonos products for multi-room audio. Normally $149, Sonos just put a batch of certified refurbs on sale for $119, matching the best price we’ve ever seen. Every refurbished Sonos includes the standard one-year Sonos warranty and access to their support, so there’s really no downside in going this route, if you can find refurbs in stock. Every other time Sonos has offered this deal, it’s sold out quickly. Anker’s nylon-wrapped PowerLine+ Lightning cables look better, feel nicer, and last longer than the ones you can buy from Apple. Oh yeah, and they cost half as much on sale. Get the 3' red model for just $9 today with promo code ANKER293, complete with a pouch. Jelly Comb Cable Organizer | $9 | Amazon | Promo code FMN7J3YF. Orange only. You probably keep a lot of charging cables, battery packs, hard drives, and other sundry tech accessories rattling around in your bag, and your collection is unlikely to shrink any time soon. But it’s easy to keep them organized and untangled with this $9 organizer (with promo code FMN7J3YF), which is big enough to hold an iPad mini-sized tablet, plus a ton of various accessories. The code will only work on the orange model. We’ve seen our fair share of USB power receptacle deals, but a two-pack for $15 from iClever is the most affordable option yet. Half the things you plug in these days probably plug into USB, so it just makes a ton of sense to install these around your house. Just make sure you know what you’re doing. Anker makes a surge protectors now, which is...incredibly logical. Their newest, largest model is down to $27 today with promo code ANKERPS2, and includes 12 AC outlets and three USB ports, plus a flat, swiveling plug that fits nicely behind your furniture. Surge protectors actually wear out over time, so if you haven’t replaced yours in awhile, this is a good opportunity. LG’s 2017 OLED TVs have achieved something of a cult status thanks to their inky dark black levels and vibrant colors. Today though, we’ve got the best price we’ve ever seen on the gorgeous, glass framed 2018 E8 models. The picture quality got an upgrade over last year’s model thanks to a new processor that improves color accuracy, reduces artifacts, and supports HFR (high frame rate video) up to 120 FPS. HFR content doesn’t really exist yet, but a few movies are expected to come to streaming services starting later this year, so if you’re planning on using the TV for several years, it might be worth it for future-proofing purposes. MassDrop has the 55" marked down to $2,200, and the 65" to $2,800 (select the 65" option at checkout). You can also get last year’s 65" entry level model for $1,600 refurbished from Walmart, if you’re on a budget but want the larger size. It doesn’t have the new processor, the glass frame, or HFR, but it still looks amazing. If you want the durability and lifetime warranty of Anker’s PowerLine II charging cables, but you own a lot of different devices, this new $11 microUSB cable (with promo code ANKER846) includes Lightning and USB-C adapters attached to the end. It’s a little awkward, but it’s nice to know you’ll always have the right cable handy. Update: The campaign is into its final week, so this is your last chance. Depending on how fussy you are about your sleeping temperature, BedJet is either one of the four horsemen of late capitalism, or a life-changing miracle. We’ve tested their old model, which was effective at cooling and heating a bed with an adjustable stream of air, but had major complaints about the UI. That seems to have been addressed with the BedJet 3, now up for preorder on Kickstarter, with major discounts available versus MSRP. The air pump itself is much more attractive than the old model, in case it’s visible under your bed, but the major improvement is the remote, which is now more ergonomic, and includes a color screen and backlit buttons. The app is getting a redesign as well, and the new model will even work with Alexa. At $249 for a single base unit, $458 for two, or $559 for two plus a special dual-zone sheet that lets you maintain a different temperature than your sleeping partner, it’s a major investment. But sleep is important! And if you have trouble getting to sleep when you’re too hot or two cold, it could be a sound investment. You know that person that always seems to have a knife ready to go when a box needs to be cut open? You could be that person with this discounted Kershaw Cryo knife. We saw this one get lower during a Gold Box in June, and during the holidays last year, but generally speaking, $20 is a great price. Get caffeinated with this 20% off coupon on 12 packs of Starbucks Doubleshot espresso drinks. They have two espresso and cream drinks (both light and regular), plus salted caramel and Cubano, which is sweetened espresso. The coupon only applies to Subscribe & Save orders, but you can get the 20% off even if you only get one shipment. Just be sure to cancel your subscription after the first order ships if you don’t want more. If you want an Instant Pot pressure cooker in time for Thanksgiving dinner prep (you do), the standard 6 qt. model is down to $80 right now ($20 less than usual), and the family-sized 8 qt. is down to $90, from its usual $140. In addition to pressure cooking (which is a damn miracle), this is also our readers’ favorite slow cooker, and one of their favorite rice cookers too. To put it simply, it’s one of the most versatile kitchen gadgets you can own. I turned some rock-hard frozen chicken breasts into fork-tender shredded chicken in about 20 minutes last night, including preheating. I didn’t thaw them, I just threw them into the Instant Pot. It’s like cheating. There are a couple different DIY fixes (toothpicks, rubber bands, etc) to remove stripped or damaged screws, but if you don’t have the time or patience to try those out, consider grabbing this $6 Dr. Meter kit. It includes four drill bits that grip into stripped screws, making them easier to remove. Just be sure to enter NAZSYJFS at checkout. Why measure distances with a tape measure when you can measure them with a laser? This model from Bosch is down to its best price of the year, and can measure distances up to 120 feet to within 1/16 of an inch, and it can even calculate area and volume for you, if your middle school math skills are feeling rusty. Rather than simply printing lines on the sheet to keep your letters straight, Ghost Paper’s lines are very slightly embossed, giving your pen an actual base from which to start each character. We tried one of these out and loved it, and you can get your own notebook for $5 off today with promo code KINJA1018. Ghost Paper also comes in stationery form now, and you can get a set for just $10. That’s half the usual price, and the discount is due to a defect on the cartons that hold the paper and envelopes, though those are in perfect condition, which is all that really matters. Just add it to your cart, and you’ll see the discount at checkout. Whether you wear TOMS for the ease of never having to tie your shoes, or just dig the style, this is one deal you should take advantage of. You can save an extra 30% on their already-discounted Flash Sale styles with promo code SAVE30. Dozens of styles for men, women, and kids are included, so you should have no trouble finding a pair that you’ll love. Whether you’re worried about losing your wedding band at work, or you just don’t want to end up like Jimmy Fallon, silicone wedding bands are practical, affordable, and actually pretty good looking. If you’re curious to try one out, Enso just kicked off its birthday sale, taking 30% off every ring they sell. We just tried out Enso’s Elements ring, which incorporates real metal into the silicone for a bit of shine, and while it won’t fool anyone up close, we were still impressed. But they also offer a ton of other styles too, some starting around $10, and they’re all included in the sale as well. Hell, they’re cheap enough that you could buy several, and pick one based on your mood or outfit. Kindle Unlimited is basically Netflix for ebooks and audiobooks, and Amazon’s offering a very rare discount on the service today. You’ll get your first six months for 50% off, after which you’ll be automatically billed the regular $10 per month, unless you cancel. If you love to read, this is a great chance to sample the service without fully committing. The deal is exclusive to new Kindle Unlimited subscribers. You’ve played the American version of Ticket to Ride. Maybe even the European one. But turns out, there’s a Nordic Countries version too. Become the railroad baron of Norway, Sweden, and Finland for just $26 today, within about $1 of an all-time low. If your desk isn’t adorned with quite enough adorable Funko figures at the moment, you can fix that right now with Walmart’s big sale. A bunch of licensed figures from Stranger Things, Star Wars, Blade Runner, Horizon Zero Dawn, and more of your favorite media are on sale for $5 or less today. If you missed out on preorder discounts and bonuses on Shadow of the Tomb Raider, it’s $10 off today on Amazon, for PS4 only. That’s not a huge discount, obviously, but it’s a fine game to pass the time until Red Dead and Fallout 76 come out. Red Dead Redemption 2 pulls into station in just over a month, and you can take in all the natural splendor by playing it on a PS4 Pro . This console bundle doesn’t have a unique design like the recent Spider-Man console did, which may be a good or bad thing, depending on your preferences. But what it does have is the game, essentially for free with the purchase of the $399 console. The Switch Pro controller isn’t just one of the best ways to control your Nintendo Switch, it might be one of the best gamepads ever made, period. If you have a Switch and still haven’t picked one up, $60 is a really good price - we rarely see it drop below $64. Arcade1Up’s 3/4 sized arcade cabinets look stunning, include multiple games, and are a steal at $300, especially since they were supposed to cost $400, according to the original announcement. They’ve been out of stock at Walmart for months, but are available to preorder once again, so if you’ve got the space and the love for old arcade games, you’ll have one of these in your home by mid-October.